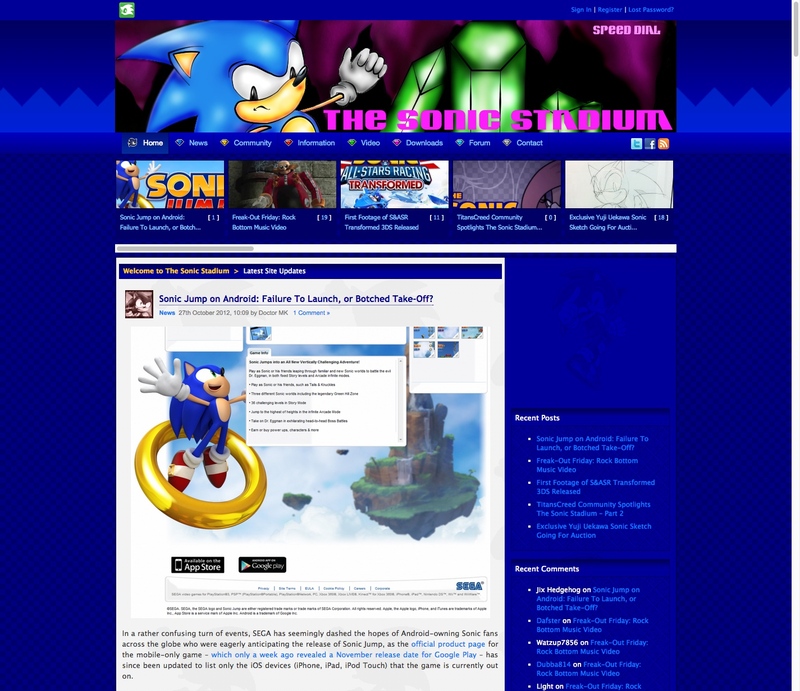 To say that The Sonic Stadium stuck with one single design and ran with it for ages is a downright lie. Especially when Dreadknux says it. This website has had more alterations than Michael Jackson, and will probably have more in the future. You can never tell just what will look awesome six months down the line. It has to be said that in recent years design modifications have grinded to a crawl, but in TSS’ early years it was all the rage. 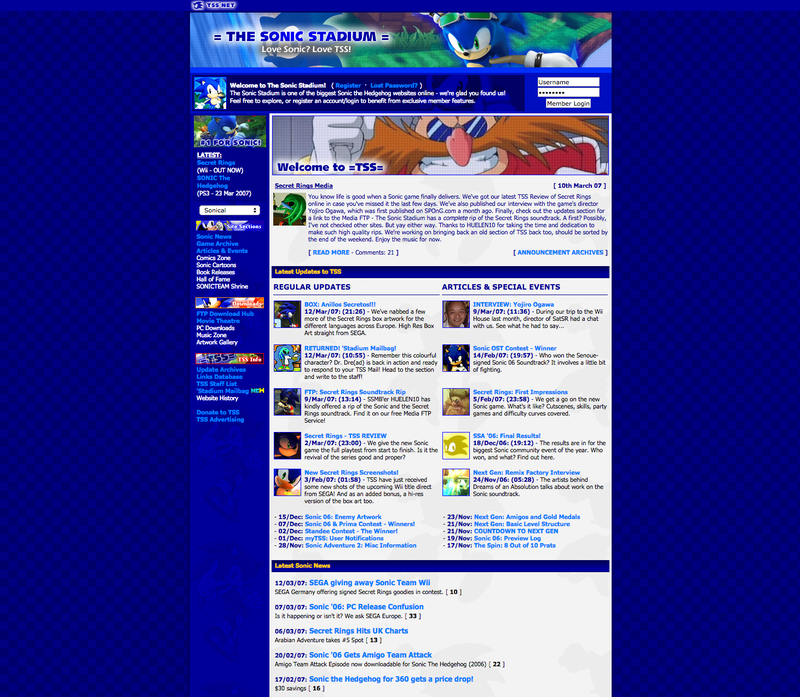 Take a look at what this site used to look like. This was the very first version of The Sonic Stadium. 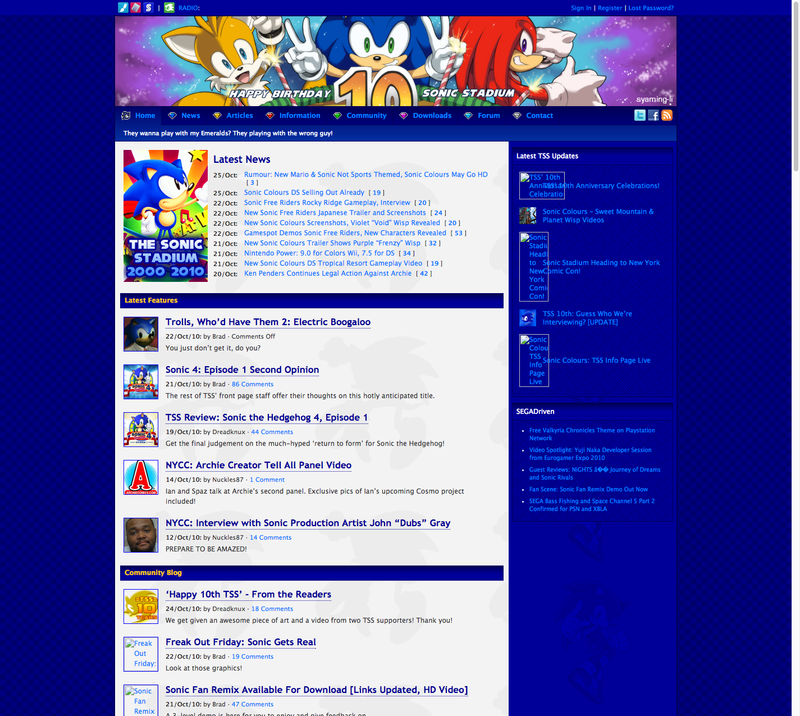 Dreadknux started working on this website round about March-May 2000, and worked from basic HTML, which he learned from a school library book. 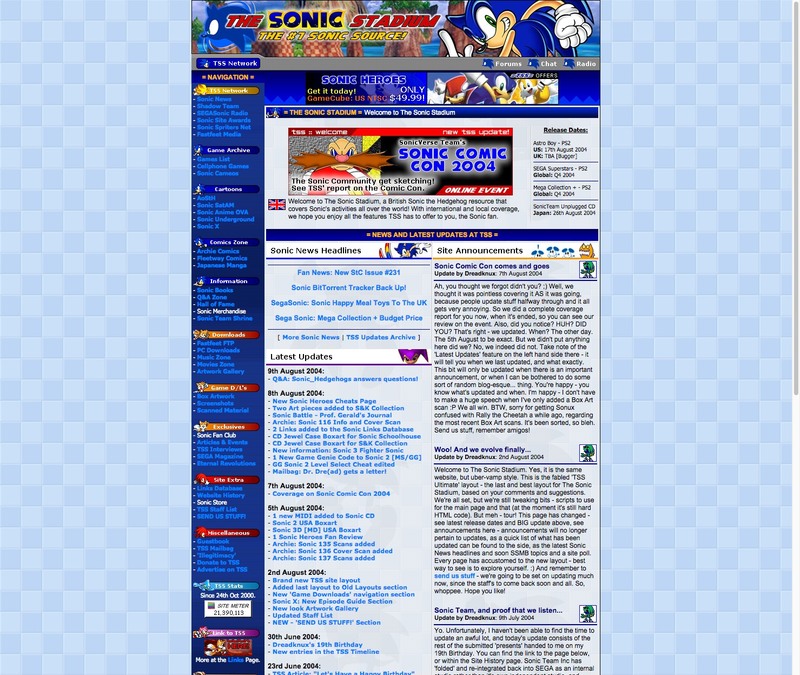 It taught the basics well, and after six months of working on-and-off he was finally able to launch the site you see in the screenshot above, on 24th October 2000. 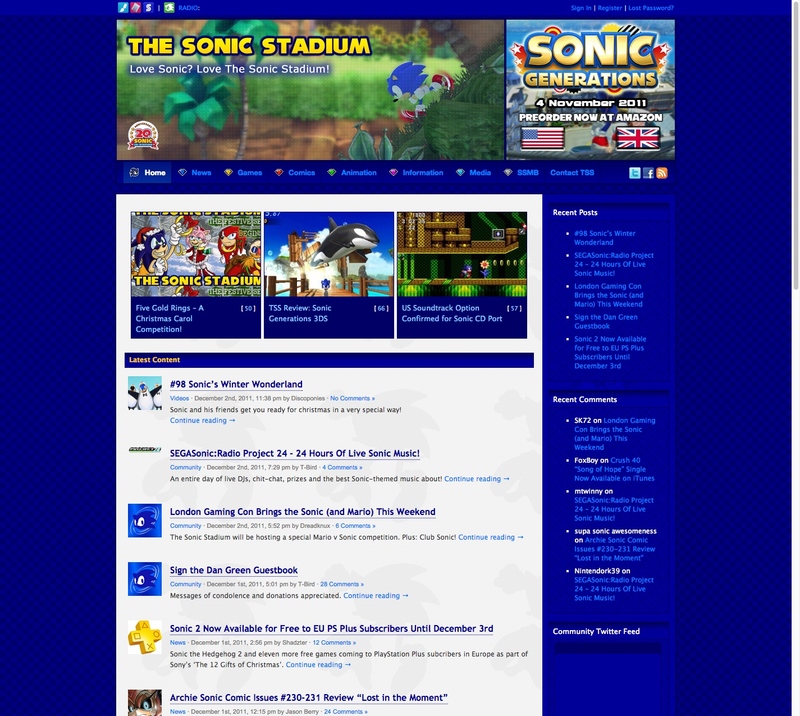 That day, the world saw the start of a revolution in Sonic the Hedgehog websites… although you couldn’t tell at the time by looking at us. Despite its simplicity, this is perhaps our favourite old design. Being the first, it will always hold a ceremonial place in our heart. So here it is, the first ever Sonic Stadium, complete with early schoolboy Dreadknux speak! In retrospect, we don’t know why we put borders on those tables around the navigation links on each side of the page. It would have looked a lot better without them. Oh well. The site was hosted by the god-awful STAS.net web hosting provider at this time, which resulted in a deletion of the entire site when the service finally gave up the ghost. But there you go. Had some good times. Like the Sonic Adventure 2 madness that surrounded this version. 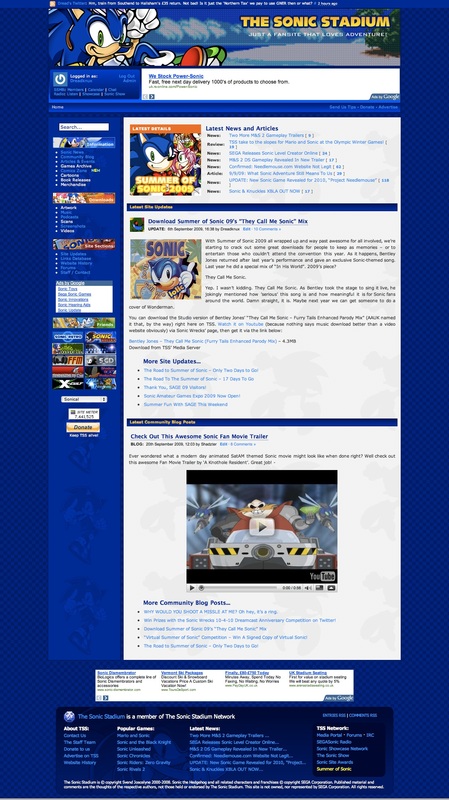 The announcement you see on the screenshot above mentions the first pieces of fan work for the newly born Sonic Fan Club. This was also the time that Dreadknux had to take time off of TSS for his high school final exams. June would be his birthday (and Sonic’s), and with STAS down the crapper, he promised a brand new look for visitors in that month. You can see that, and further revisions to this design, in the links below. 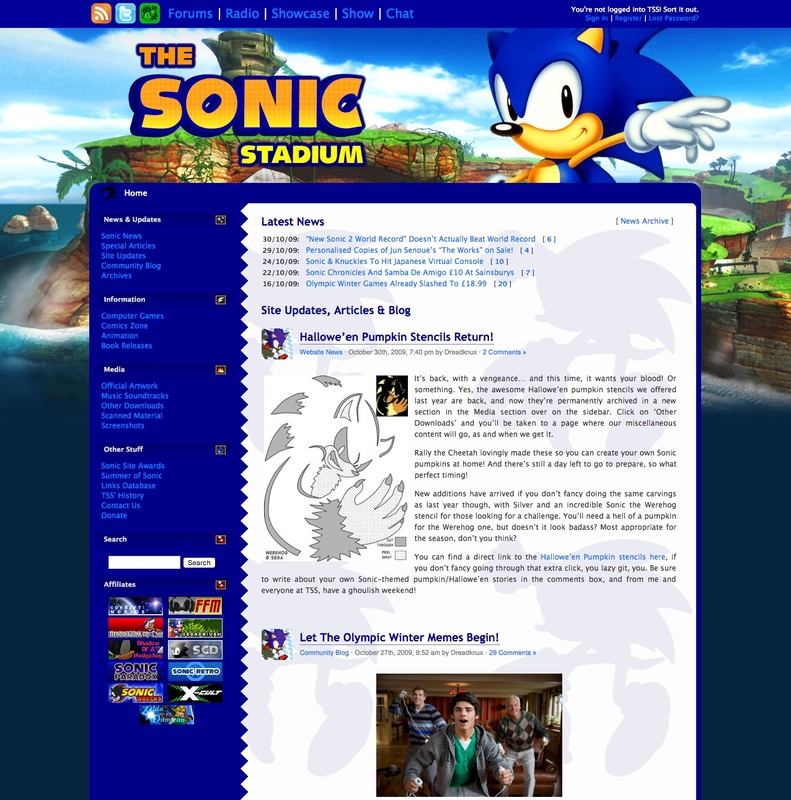 This was the point in which Dreadknux got a little more sensible about the page layout, and applied what he knew about visitor feedback to make The Sonic Stadium a better place. In this instance, many pages before this layout were in “open space” as it were, so the width of the screen resolution would stretch and make the text or content go funky. SSNG launched triumphantly in June 2002 after a few design prototype changes, and lasted around two weeks. 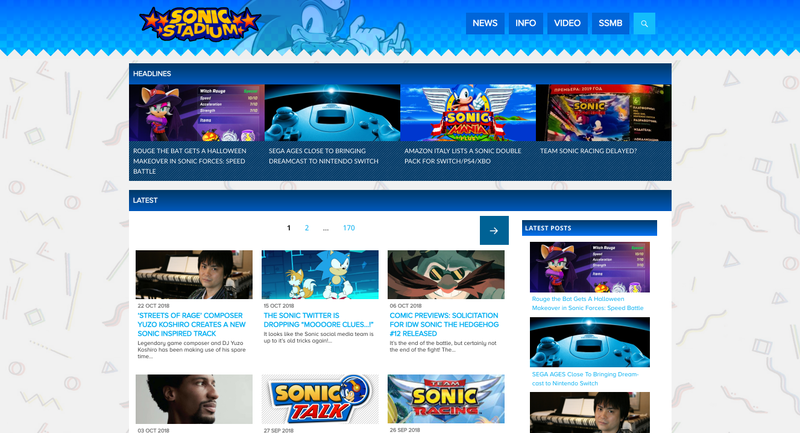 While it was warmly received by fans of both The Sonic Stadium and Sonic News, it transpired that some of the content and backgrounds from the Sonic News side had been lifted from fellow fansite Sonic HQ. 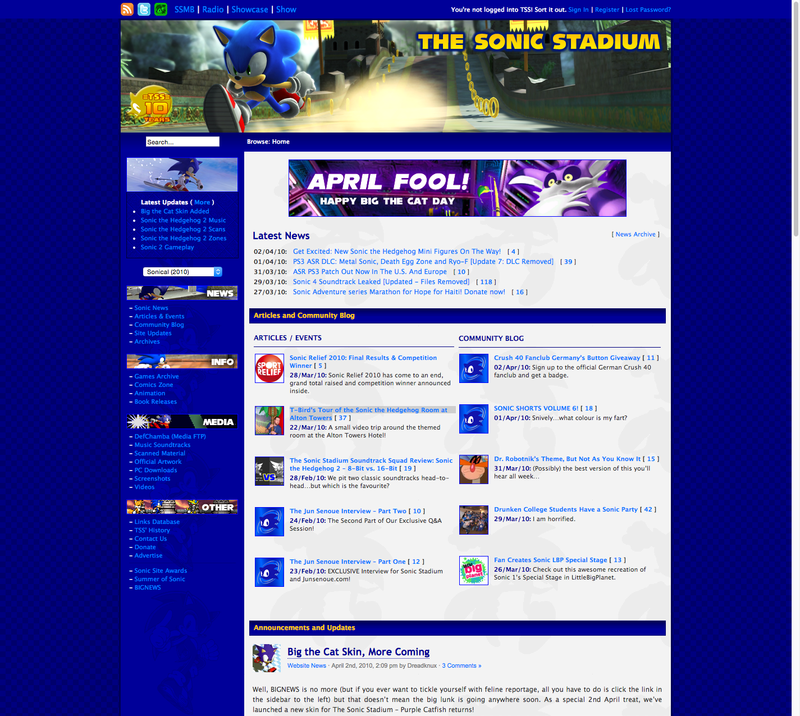 Additionally, with a bigger, merged site came a greater workload and shared responsibility to keep it up to date, which was difficult to maintain after the Sonic News webmaster did a runner shortly after Sonic HQ fans started attacking SSNG and hijacking the SSMB Forums. After realising that the Sonic HQ community couldn’t be satisfied following a number of apologies, the decision was made to just kill SSNG and start over. 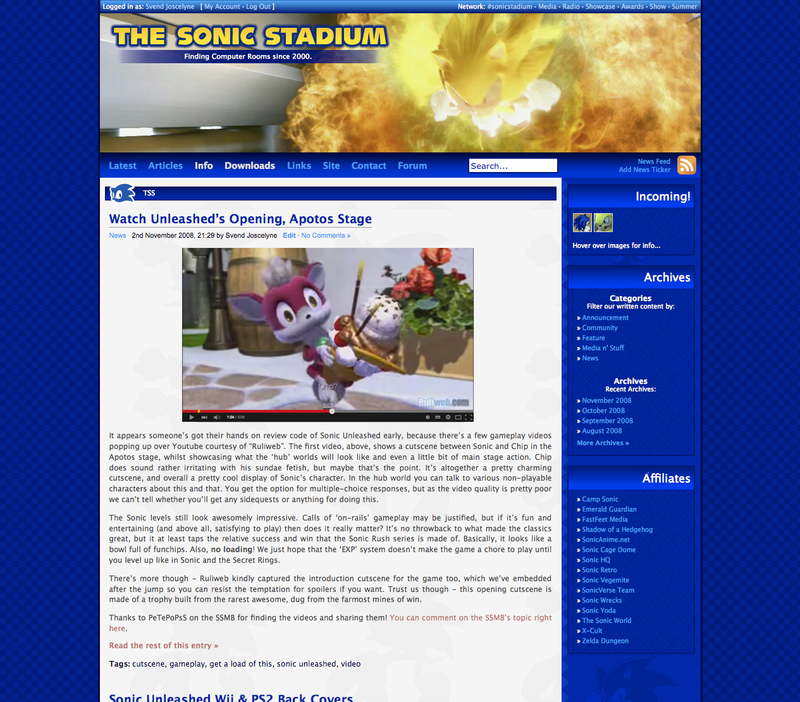 This was undoubtedly where The Sonic Stadium started picking up pace. And the fresh start from SSNG did us good. 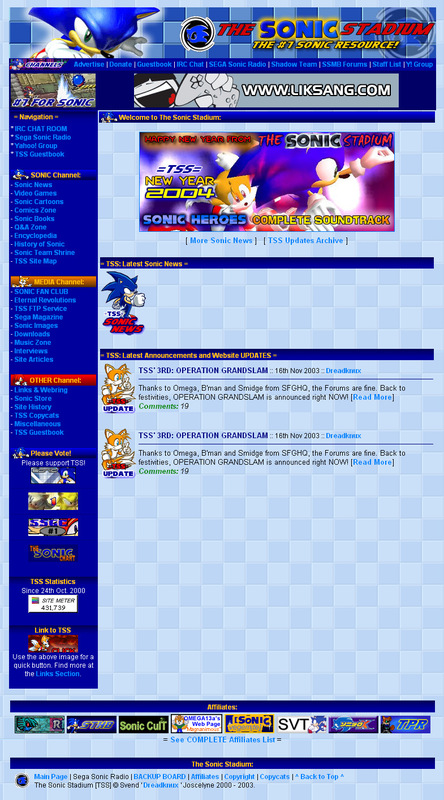 Zifei, the legendary founder of Sonic HQ, paid for hosting for TSS and when we moved, this design was born. Despite security troubles and even being kicked off for using the resources we paid for by HostOnce (here’s a tip: don’t get hosted by them), this layout remained for several months to come. This design – and the many revisions that followed – were a result of Dreadknux’s dabbling with PHP coding. 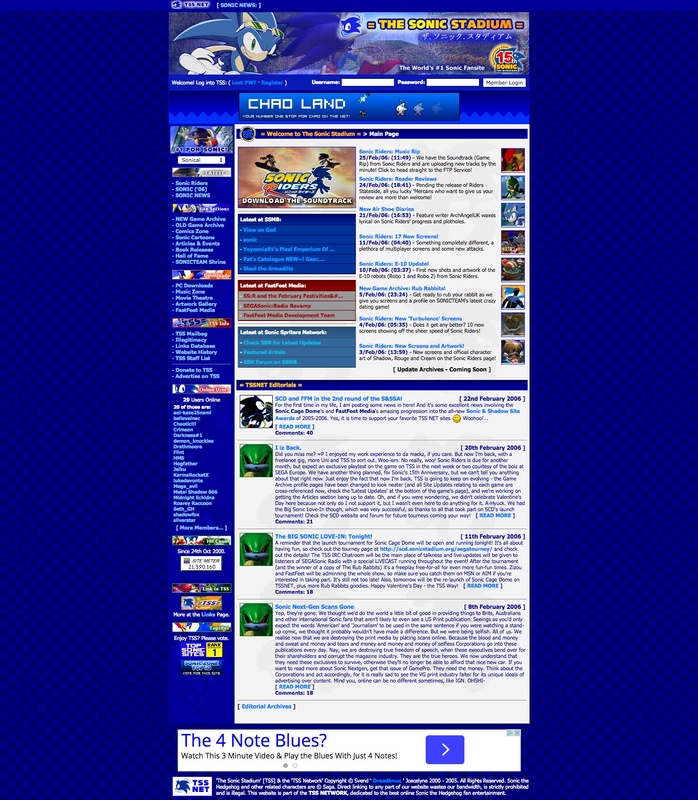 The original layout in June 2003 involved a navigation menu that was coded in its own PHP file, which was then called on every page – meaning that any changes to the menu only required the modification of one file. This design also incorporated a third-party PHP-based news system, which was integrated into the site to allow for news and updates to be posted without creating new HTML pages. Most revisions during this era involved improving the homepage or re-creating the navigation menu. 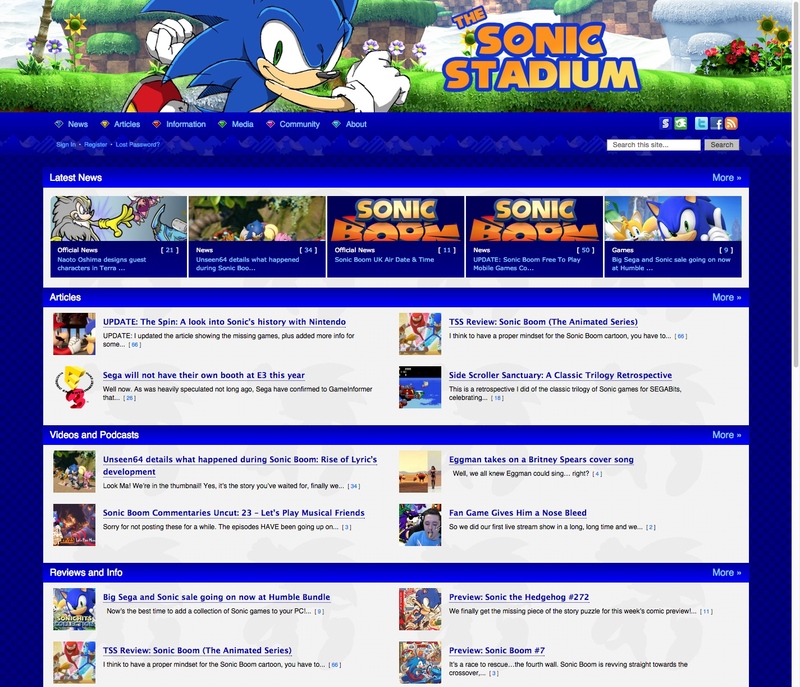 This is the most feature-complete version of The Sonic Stadium’s original format, based heavily on a custom CMS backend built by B’mn. 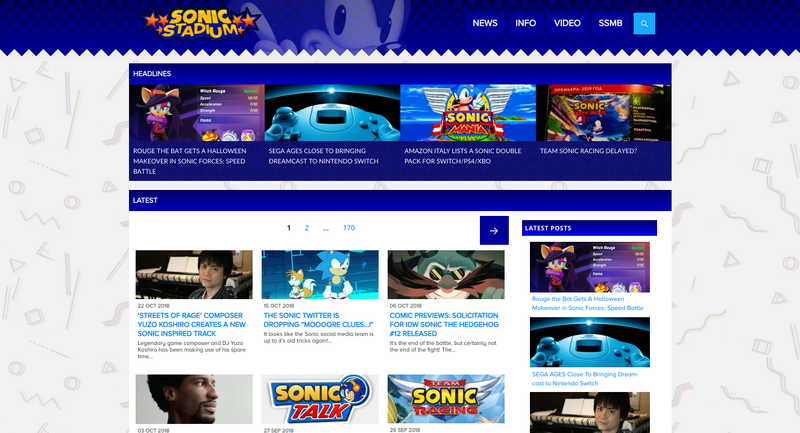 Using this design, we were able to pull content from the SSMB Forums and other TSS Network sites, allow for comments and open the site to user-generated content like fan reviews that admins could sub-edit and approve. We were also able to establish Game Archive pages which connected dynamically to game-releated pages on other sections of the site – something that’s not simple to accomplish on a blog-based CMS. With our custom home-made CMS getting old and unfit for modern purpose, we started looking for a new backbone for The Sonic Stadium. After fiddling with Drupal and other CMS providers, Dreadknux settled on WordPress. Blogs were starting to become a popular new way to deliver content, and we were interested in shaping our content to adapt for audiences that were growing to have less time to invest in long-form pieces. The new design created a brand new editorial direction for the site, blending its usual offbeat humour and creative tone of voice with a heavy dose of tongue-in-cheek opinion. You could say this was the period TSS went a little bit ‘rock and roll’. The first versions of this design emulated the previous design as much as possible, before blossoming into the colourful ‘ultimate form’ you see above. With the new blog direction successfully established, we wanted to bring the design back to basics a little bit. We heard a lot of fans’ feedback that they remembered the accessibility of TSS’ 7th Design, so we incorporated elements of that classic layout back into this new blog content format. Over time, we slowly drew away from that in a number of revisions, where we wanted the latest content to feature more prominently on the homepage. The major change we made with this design was in our approach to the homepage and header – we felt that on slow news days, we wanted to make our readers aware of legacy and evergreen content we would have on archive. That, and we wanted to be known for more than just news, but also features and interviews (which we have plenty of). So we segmented the homepage to try and draw attention to it. We also leaned heavily on the Top Stories carousel, making it appear on every page.